Need a way to display a flat screen? 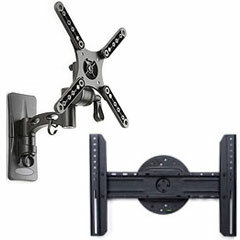 These universal TV mounts are great for both homes and businesses. They can be used in professional settings to advertise and inform visitors without bulky consoles taking up floor space. 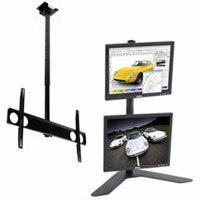 These TV mounts, also known as LED TV brackets, are also ideal for demonstrating merchandise and cross-selling services in retail environments. In homes, mounts like these can be used in the living room or bedroom for TVs on walls. At airports and other public waiting areas, TV brackets keep visitors occupied with sports scores, financial tickers and news crawls. How do LCD screens attach to these TV brackets? These LED TV mounts are sold with universal VESA mounting hole specs. These standards were created by the Video Electronics Standards Association for standardizing mounting bracket attachments. Television manuals provide these VESA specifications. This information is used to identify the flat screen holder that will work with a specified flat panel. Each model's page lists its VESA hole patterns in the "Specifications" area. When installed on VESA-compatible mounts, LCDs remain securely attached, safe from falling off or unintentional movement. These fixtures can be attached to any surface. They tilt, rotate, extend and retract from a ceiling or wall. They free up floor space for literature displays, product samples, sales staff and prospective customers. These monitor stands for a flatscreen include an array of adjustable settings. Some of these mounts come hold two, three, four and even six LED TVs at once. Many of these units hold them in either a portrait or landscape orientation to meet any need. What else do they come with? 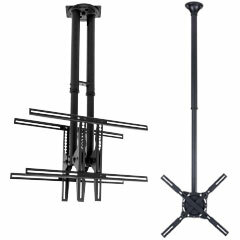 These universal TV brackets often include articulating arms for extra adjustability, like changing the distance from a television to the wall or ceiling. Are these TV fixtures suitable for commercial areas? Supervisors of public venues, such as airport terminals and train stations, use them for advertising to passersby in high traffic areas. Waiting rooms, indoor malls and other busy areas make great use of these stands by entertaining patrons. These units feature a strong construction and a durable design that will last for years in areas with heavy traffic. They will also keep displays still and secure from jostling. Each frame is made of sturdy steel, aluminum, plastic for enduring any environment. Models for each placement style, countertop, ceiling and wall, feature different designs for different setups. Units for wall surfaces feature a low-profile design that measures 2" or less in depth. These are ideal for keeping floor space clear in tight rooms or hallways. Countertop posts for flat panels remain stable by clamping directly to horizontal surfaces. 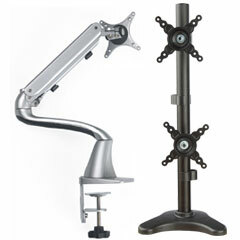 These come with an articulating arm or a simple standing design that holds displays in one place. Affordable counter posts are available with the option of a cable lock for added security in public environments. Ceiling poles feature a single- or double-sided frame and are made with varying lengths. All plasma hangers feature an adjustable height for accommodating different locations. They can also be made to showcase flat panels right next to windows, making them great for storefronts.